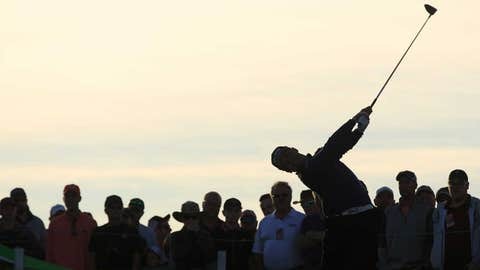 Defending champion Hideki Matsuyama plays his tee shot on the 11th hole during the first round of the Waste Management Phoenix Open. SCOTTSDALE, Ariz. — Bill Haas’ 9-iron landed to the right of the pin and spun left, settling 3 feet away for a birdie on the par-3 16th in the Waste Management Phoenix Open. “I just tried to play the hole like I would any other hole, even though it’s not like any other hole,” Haas said about the stadium hole that was packed with 20,000 fans on the warm Thursday afternoon. “Once you get a cushion like that, you can free your swing up a little bit,” Haas said. The 16th, playing 151 yards to a front pin, tripped up Rickie Fowler and Justin Thomas. Fowler bogeyed it in a 66 that left him tied with Billy Horschel, Bryson DeChambeau, Chris Kirk and Chesson Hadley. Thomas made a double bogey in a 68. Fowler hit short into the right bunker and two-putted from 30 feet. The fans let him hear it, too — at 9:30 a.m. with only the general-admission sections full. “I just barely caught it heavy, but I thought it was at least going to cover the front, and there was just no sand in the bunker,” Thomas said. “Some good and bad all around,” Fowler said. “Just kind of humbles you, grounds you a bit, and makes you realize that there’s a lot bigger things than just playing golf,” Fowler said. “I don’t think I missed a single shot after that eagle,” Rahm said. Playing directly behind Fowler’s group, Rahm and fellow former Arizona State player Phil Mickelson each birdied the 16th for the loudest roars on the hole in the morning — other than the helicopter that buzzed the stands just before playing partner Xander Schauffele hit. “He’s Phil, he can actually argue he tried to do that,” Rahm said. Wearing a “Rahmbo” headband, Rahm made a 12-footer . The 47-year-old Mickelson had a 70 in his record-tying 29th start in the tournament he won in 1996, 2005 and 2013. Mickelson’s brother, Tim, coached Rahm at Arizona State and was his agent. Tim Mickelson is now his older brother’s caddie. Hideki Matsuyama, a playoff winner over Fowler in 2016 and Webb Simpson last year, had a 69 playing alongside his two sudden-death opponents. The Japanese star is trying to match Arnold Palmer’s record of three straight victories. Palmer accomplished the feat from 1961-63.